The PowerGrip GT2 Belt Drive System is an advance in product design over the Gates‘ older, standard HTD system, providing higher torque carrying capability and improved load carrying strength. Both the PowerGrip GT2 and GT3 System‘s deep tooth design increases the contact area which provides improved resistance to ratcheting. The modified curvilinear teeth enter and exit the pulley grooves cleanly, resulting in reduced vibration. Application Examples for the PowerGrip GT2 and GT3 drive systems: Machine Tools, Hand Power Tools, 3D-Printers, Medical Diagnostic Equipment, Automated Teller Machines, Robotics Equipment, and Vending Equipment. The efficiency and integrity of a belt drive is closely attributed to the quality of pulleys involved. The pulleys therefore, should be supplied by qualified and licensed suppliers. Stock Drive Products is licensed by Gates. The GT2/GT3 pulleys manufactured by Stock Drive Products are made using licensed hobs, achieving the precise fit for the drive system. The pulleys offered here will mesh perfectly with either the GT2 or GT3 belt. Drive belt and pulley misalignment can significantly contribute to noise, vibration, bearing and pulley wear leading to premature bearing failure and costly machine downtime. SKFs Laser Belt Alignment Tools provide faster and more accurate alignment over traditional methods. 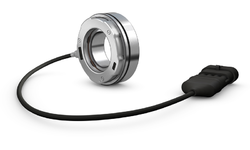 Increasing bearing life, reducing noise, vibration and minimising wear on pulleys and belts. You can now align all belt drives with just one tool. The TKBA 10 and TBKA 20 series of Belt Alignment Tools offer fast accurate laser alignment of pulleys and sprockets. Using powerful magnets to hold firmly to the pulleys side face, the transmitter projects a line to the receiver (mounted on the opposite pulley). Various indicator lines on the receiver give an immediate visual indication of any offset or misalignment with the belt. The line reflected back to the transmitter showing any horizontal misalignment between the two pulleys. The TBKA 40 Laser Belt Alignment Tool aligns the pulleys V grooves not the side face, providing the most accurate horizontal, vertical and parallel belt alignment. Groove alignment also allows pulleys with differing faces or widths to be aligned with greater confidence. Attached to the pulley using magnets with V guides to aid accurate placement. Automaticic Lubricators improve cleanliness, accuracy, safety and reliability. Acorn stock a comprehensive range of SKF Automatic Lubrication products. 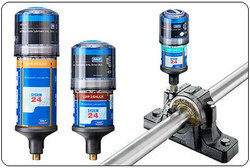 Designed as a supremely reliable alternative to traditional manual maintenance, SKF's SYSTEM 24 Grease Dispenser range is a pace-setting Automatic Lubrication System. For many applications, monitoring the status of rotating components accurately is essential. This is particularly true for AC motors that require encoders to continuously measure speed and the direction of rotation. YNR motor encoder units BMB-6208/080S2/UB002A can provide a signal resolution ranging from 32 to 80 digital pulses per revolution. They are available for shaft diameters ranging from 15 to 45 mm. 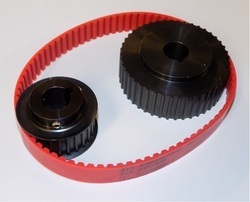 The drive pulleys 5mm The increased use of spline connections with involute tooth flanks has brought us to purchase a wide variety of hobbing and tools and this is in accordance with the various standardization systems. These connections can be “sliding” or “fixed”, and with “centering” on the tooth flanks or on the external diameter of the axle (tooth tip) or on the inner diameter. The involute spline connections are similar to the classic teeth for gears, with a pressure angle of 20° or 30° depending on the standard used. The intention which is the basis of this idea is: external spline connections manufactured in the same way (same machines and similar tools), as for the classic gears, by hobbing (hobbing and cutting tools). The corresponding internal spline connections manufactured by the gear generating proces at tooth hobbing machines (Fellows &-Lorenz) or by broaching machines (for larger series). Certain systems are even equipped to use the same milling tools as for normal teeth. The most common pressure angles are 20° (with adjusted positive addendum modification to obtain an effective pressure angle of ± 30 °in the area of the pitch circle; i.e. NBN 270 or PN-E 22-141) and 30° (DIN 5480, 5482 and AISI-B92-1-1970). Recently the Americans added to the standard used pressure angle 30°, the standardization of the pressure angles 37°30′ and 45°. For choosing the tooth numbers, the module, the type of centering and fitting, we are referring to the tables published by the various standardization organizations.